Compatible with Roland, Alesis and Pearl drum modules and the DDrum DDTi Trigger Interface, a variety of e-cymbal conversion kits are now available for CRX AIR Low-Volume cymbals. Offered by Stealth Drums, a world-leader in e-drum technology, Stealth Cymbal Conversion Kits are a great way to add the the look and feel of real cymbals to any studio or live e-drum situation. 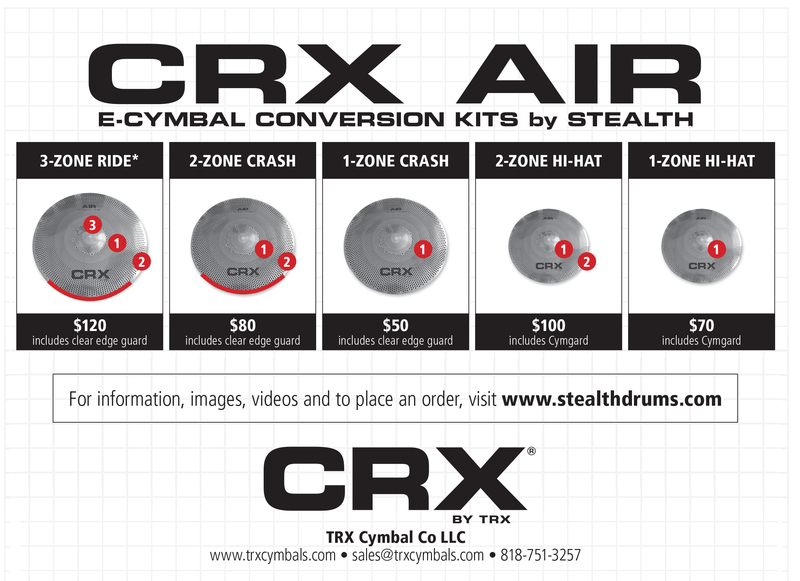 Stealth’s advanced, performance-proven triggers quickly install on CRX AIR Low Volume ride, crash and hi-hat cymbals. The kits feature premium-quality components and include easy-to-follow installation instructions. For information, images, videos and to place an order, visit www.stealthdrums.com. Download the flyer here. previous post: NDK™ Series Adds A New Option To DRK™ Series.